Heavy rain last night, and a damp misty morning. 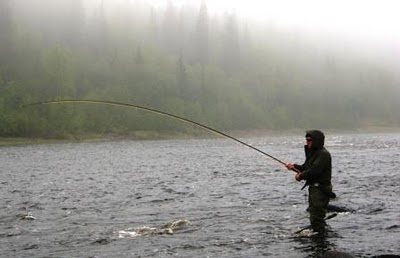 At morning radio call Kitza confirmed that they had 40 to their seven rods yesterday. A good result. I flew up to the village to see the huge truck that arrived last night after a two day drive up from St Petersburg, laden with this years village supplies. On it I hoped were many important items amongst which were a washing machine for Leanna here at Lower Camp, and two outboard engines. 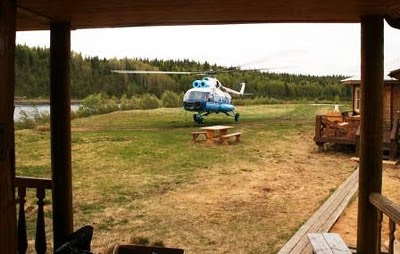 I guess I had made a bit of a fuss about getting this kit into Camp as quickly as possible - typically Michaelovitch pulled my leg and landed the helicopter not on the heli pad but right outside the modest office that over-looks the river. The good news is that the saw-dust left behind by the builders on the grass by the lodge has gone, the bad news is that most of it ended up in the office. This was compounded by a massive stone fly hatch; they seem to love my printer and when I print a document there are a handful of stone flies ironed onto the page. Jeff G had a tough day too, lost a good fish that darted through his guides legs at the last moment, broke his rod, and then had his zinger snap. The later a small thing I know, but really trying when a day is not going well. On the fishing front - wish I could report more news - Tom at Kitza had set dinner back to 9 p.m. as rods were still out, I know that Oliver P had a 20lber from Beaver. It sounded like a good day over there. Pana picked up with 37, again with some big'ish fish, 7 over 12lbs and two around 15lbs. Here at Lower we had 24 to our five rods by this afternoon, several went out this evening and I hear that Didier F-M has just had his 60th salmon for the week. No real rise in river level after the rain, it remains steady at the moment - and still a consistent 10 degrees. It looks well set for next week. ....Большое спасибо Лене и Мише, Федору, Паше, Леше и Сергею за поддержку обеспечения рыболовной программы. Надеюсь, что вам удалось порыбачить немного больше в этом году. Также, огромное спасибо, Владимиру, Минере и Марине. Я ценю вашу помощь. Вернусь 19-26 июня на Пундостров. Скорей всего я вас уже не увижу, поэтому мои лучшие пожелания и огромное спасибо. Жду с нетерпением следующего года – увидимся в начале мая 2011 года. Кристофер.